She’s known all around the village as “the lady with the little white dog”. 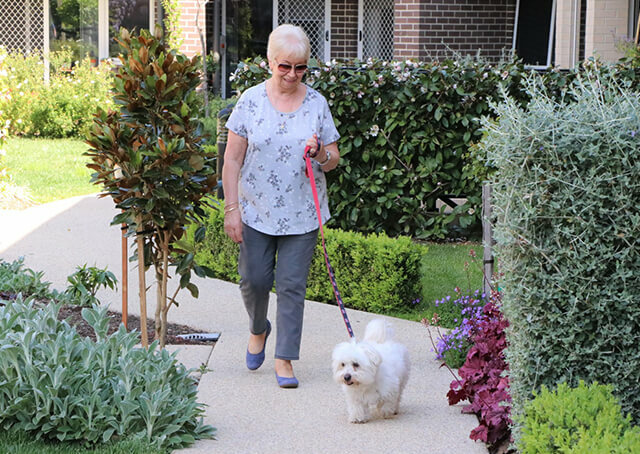 As Bev and her six-year-old Maltese bichon frise, Lilly, go for their daily walk around Weary Dunlop retirement village’s perfectly-manicured gardens, it’s as much a social exercise as a physical one. For Bev, Lilly isn’t just a much-loved companion, she’s a conduit to the people who share their village community. “My neighbours who are around here, they’re just so lovely. Because I walk round every night with Lilly, I just wave to everyone. If they’re sitting outside I’ll stop and have a chat to them, so I get to know them. But Bev’s more than just a friendly neighbour who likes to stop and chat. She’s built deep, personal friendships in the village, and established connections to the community that ensures she’s constantly busy. She helps run the village’s arts and craft group, is a member of the gardening group, attends fine dining nights each month, and attends most of the organised events in the village centre. Throw in coffee dates with friends from inside and outside the village, shopping expeditions to Brandon Park with her sister and girlfriends every Saturday (followed by lunch), regular trips out with her upstairs neighbour to the movies, for a meal, or to Chadstone Shopping Centre, and Bev’s dance card doesn’t have many gaps. Bev’s first year in her ground floor apartment at Weary Dunlop was hard. Her husband, Noel, was unwell and she spent much of her time caring for him. She hardly went out at all. When Noel died in January last year, Bev had to think about how she was going to approach life without him. But describing her simply as a “social butterfly” doesn’t quite tell the full story. Her connection to the village and its people runs much deeper than coffee catch ups and chatting to passers-by while out walking Lilly. When a neighbour is unwell, Bev does their shopping for them. When the daughter of the woman down the hall has a health emergency, Bev is knocking on the door to make sure she’s alright. When someone needs a hand, Bev’s door is one they know they can knock on. “And I don’t mind doing that – I’ll help anyone if I can. And what Bev gives to the village and its people, she gets back with interest.